I am now in China. I am here for a business meeting. I caught an afternoon flight from Taiwan to Hong Kong, and then caught a boat from HK to China. 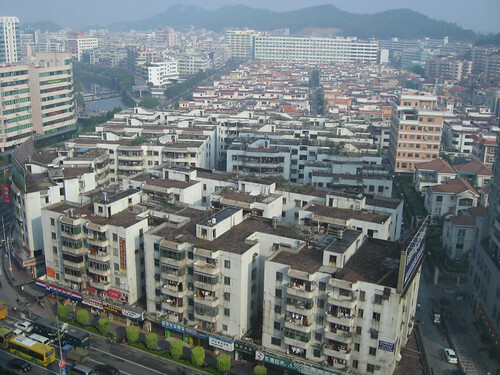 The town I am in is called Hu Men or Tiger-gate (è™Žé–€), in Dong Guan, Guang Dong. It’s just like any other city in SE China. Busy, with no character. It’s raining outside, with lots of fog. There is a martial arts competition going on on TV, and they wear really bad costumes. It almost feels like I am in a bad film noir set in China. I met a guy on the boat here, and we talked about his business. He runs a small clothing store, and he’s here picking up the latest fashion. This area in China is famous for its clothing manufacturing. After the discussion, I had a new business idea. The business idea involves a tailored-made clothing business (or maybe bespoke or custom-made fashion). I would set up a store and cute sales people to measure customers’ dimensions, send them to a design center with experienced tailors, and then the clothing specifications can be sent over the internet to factories based in China. A production line produces these tailored made items, before DHL’ing them to the customer. Previous Previous post: At the Airport, again!